Jose Mourinho’s Manchester United lost 4-0 this afternoon, during the Portuguese’s first ever visit to Stamford Bridge as a Premier League opponent. The Blues were 1-0 up after just 30 seconds, as Manchester United experienced their biggest defeat in the Jose Mourinho era. Goals from Pedro, Cahill, Hazard, and Kante ensured total and utter humiliation for Jose Mourinho, who visited Stamford Bridge for the first time since he was sacked by the Blues last season. Jose Mourinho named a rather attack-oriented side, compared to the side he fielded against Liverpool when they saw out a goalless draw. David De Gea started between the sticks for Manchester United. The Spaniard made a couple of good saves, as usual, although he was let down by United’s rather clumsy defending. Antonio Valencia and Daley Blind started as United’s full-backs. Valencia was ripped apart by Chelsea’s attack, but he was half decent when going up in attack, even providing a good chance for Ibrahimović. Meanwhile, Daley Blind had a terrible game. He conceded possession almost every time he was given the ball. He was poor in both defence and attack. It’s clear that he can’t handle the left-back position during big games, like Manchester City and Chelsea. Eric Bailly and Chris Smalling partnered up in defence, although their pretty solid partnership so far stood no chance against Chelsea’s attacking play. Bailly, who Jose Mourinho has confirmed is badly injured, could have been sent off for a challenge on Chelsea’s Eden Hazard, but was lucky not to be seen by the ref. Smalling, along with the entire United defence this evening, experienced a nightmare. 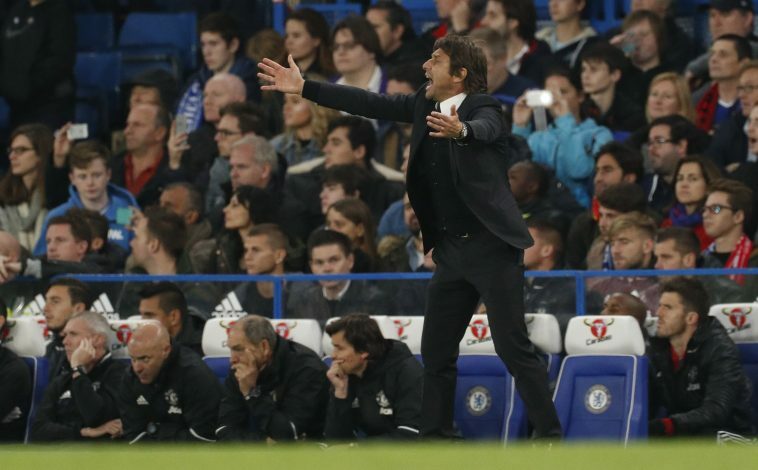 His indecisiveness led to Chelsea’s first two goals. Marouane Fellaini and Ander Herrera both paired up in front of United’s defensive lineup. Both could have done much better in helping defence and helping United’s attack. Jesse Lingard and Marcus Rashford started on the wings. 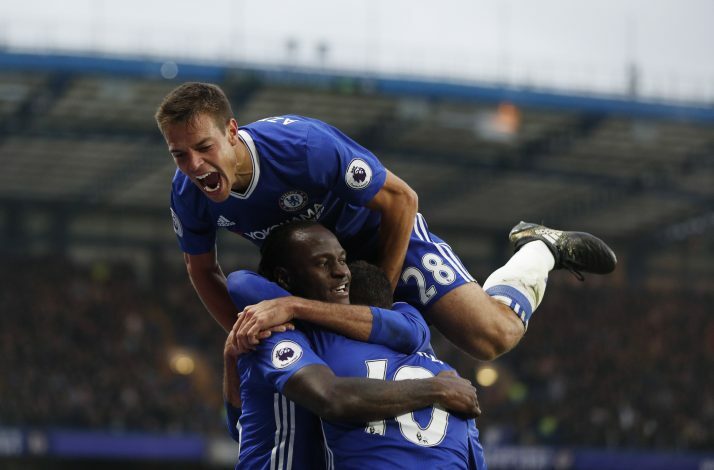 The pair spent more time trying to help the defence rather than attacking, which enabled Chelsea to pile on the pressure. Zlatan began as United’s lone striker, while Paul Pogba was deployed as a number 10. Both had a poor game. Zlatan missed a great chance in the early stages, although the Giant Swede was not given as many chances as he is used to. Meanwhile, on the other side, Eden Hazard shone for the home side and scored a fabulous goal in the second half – definitely man of the match. 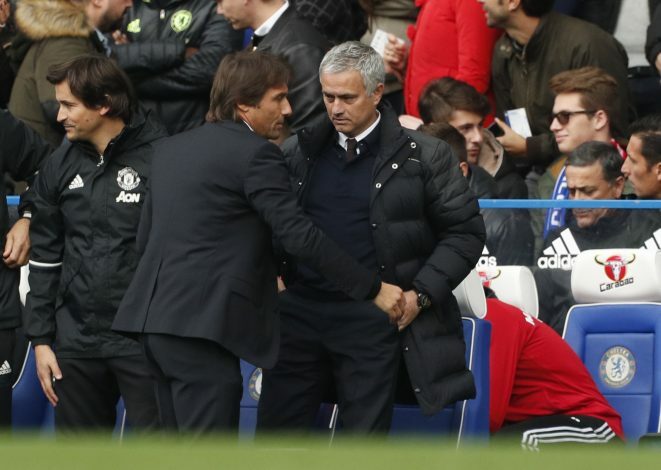 While Jose Mourinho was in charge of Chelsea, he employed a 4-2-3-1 formation which favoured a highly defensive style of play. However, his tactics backfired badly last season, and he was subsequently sacked. But now, with Antonio Conte, Chelsea’s formation has been drastically changed. The Italian sets out his players in a 3-4-3 formation, which seems to fit in well with the players. The Blues have won their last 3 games, scoring 9 goals and conceding none. Impressive stuff, considering they only have 3 at the back. Conte’s new system looks to be fitting in well with the players, as we saw this evening when Chelsea demolished their opposition. Jose’s park the bus tactic may be outdated now that everyone has experienced it, meaning that the Portuguese man may need to try some fresh ideas. The Giant Swede got his Manchester United career off to a flying start, scoring a trophy-winning goal on his debut, as well as a brace on his Old Trafford debut. However, Zlatan’s last goal in the Premier League came on the 10th of September, and well over a month has passed since then. If Manchester United are going to get anywhere this season, Mourinho may need to alter his formation to allow more balls to reach Zlatan. The more chances he gets, the more likely he is to score goals. Zlatan has so far scored 4 goals in 9 League appearances, stats which contrast heavily with his performances last season when he scored a total of 38 League goals in 31 appearances. 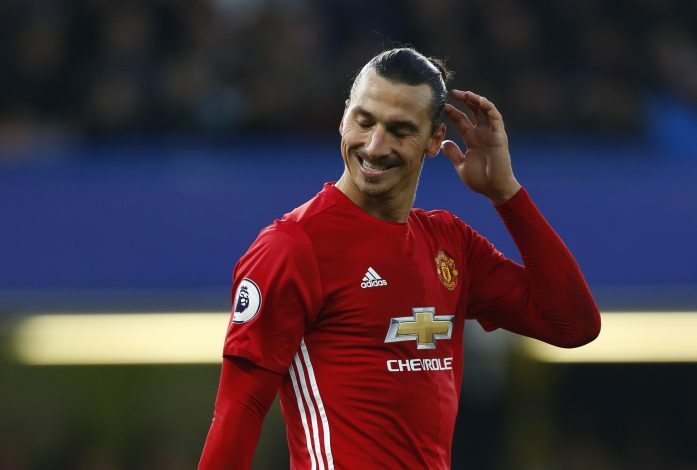 There is no doubt of Zlatan’s quality, but he needs to pick it up, or United’s hopes for a Champions League spot may be seriously damaged before Mourinho gets the chance to sign another striker. 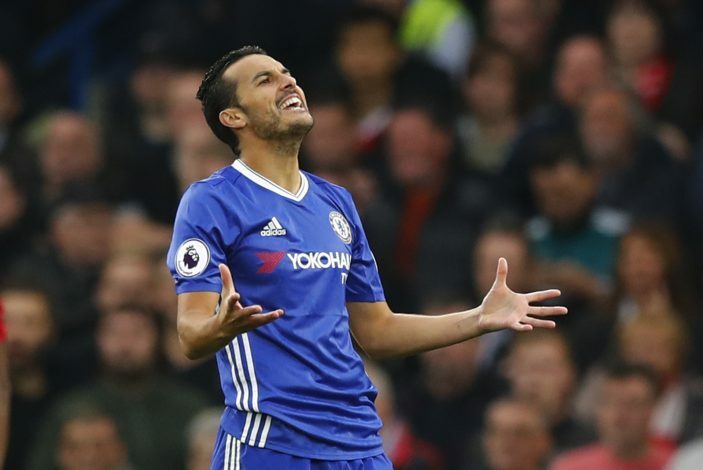 Jose Mourinho signed Pedro for Chelsea in 2015 after heavy interest from Manchester United, a missed target which is still fresh on the minds of the Red Devils fans. One season later, Jose Mourinho is now managing Manchester United, and Pedro comes to return the favour. Pedro scored within 30 seconds of the first half whistle after some quick thinking and some shoddy defending from the Red Devils. This goal just so happens to be his first of the season, after playing in a total of 10 matches. Pedro’s pace and agility were what tempted Jose Mourinho to sign him up for Chelsea, and this afternoon, the same attributes began the destruction of Mourinho’s Manchester United. The Giant Belgian midfielder managed to stay with the United squad after Jose Mourinho’s mass exodus – which saw players like Bastian Schweinsteiger isolated from the club. However, it seems like the 28-year-old’s time in Manchester is up. Jose Mourinho kept Fellaini for his immense strength and height, in the hope that the Belgian will keep things tight at the back and be a threat in set-pieces. But Fellaini is just getting in the way of things now.He slows down the attack, preventing the side from producing anything potent. He is a decent footballer, but the fact of the matter is that he is not Manchester United material, and even Michael Carrick is much better than him. The £89 million man was expected to light up Old Trafford upon his return, but that’s not been the case. Pogba, who was a key member in Juventus’ title-winning side last season, has produced inconsistent performances throughout this season and it seems to be hurting Jose Mourinho. The gaffer has already received plenty of criticism for buying the lad at such an astronomical fee. The least you could do is try and put in a few decent performances to justify your massive price tag. He scored 2 goals for Manchester United against Fenerbahce last Thursday, although he has failed to show up in all of United’s big matches this season. Pogba’s newly adopted No 10 role seems to be working against the smaller clubs, but Jose Mourinho needs to find a way to keep his side solid against bigger opponents. There is no doubt in Pogba’s immense talents, but he needs to start performing before his side face serious problems later on. Who on earth writes this S**T for you??? Because who ever it is must have been watching a totally different game to myself. Yes United were dreadful in defence but so were Chelsea the difference was that things went Chelseas way and not United’s. As for Bailly apparently should have been sent of NOT on your nelly Hazard once again went down too easy and dramatically when he dos not have to which he later proved by his goal. Where and that dirty cheating David Louis should have had a RED card and he knew it that is why he went back twice to grovel to the referee and to Fellaini. I do agree Fellaini was poor but he has been for a few games Pogba is still finding his feet and when it dos finally click all you doubters will eat humble pie. As for Bailly apparently should have been sent of NOT on your nelly Hazard once again went down too easy and dramatically when he dos not have to which he later proved by his goal. Where and that dirty cheating David Luiz should have had a RED card and he knew it that is why he went back twice to grovel to the referee and to Fellaini. I do agree Fellaini was poor but he has been for a few games Pogba is still finding his feet and when it dos finally click all you doubters will eat humble pie.